I do love biscuits. My favourites, in no particular order, are chocolate coated malted milk biscuits, chocolate coated digestives, hob nobs, and boaster cookies. If we’re talking homemade then I love custard creams and shortbread (I don’t like shop-bought versions of these unless the shortbread is the proper buttery stuff), my nutella-stuffed chocolate chip cookies and homemade digestives. I am not a fan of garibaldi or pink wafers, or those French Lu biscuits which have chocolate cream sandwiched between two stale rich teas (or at least that’s how I like to think of them). 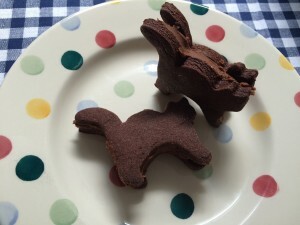 When I saw this week’s challenge, I decided against making biscotti straight away: my teeth aren’t strong enough to manage that crunch, although I did make them once before, flavoured with lemon zest, and they were tasty enough. I was very keen on the idea of making arlettes, but to make these properly I’d have wanted to make my own reverse puff pastry, and I simply didn’t have the time this week to bother with all that (especially since I have never even made normal puff, let alone reverse puff). So a biscuit box filled with biscuits it was. You won’t be fooled by the basic decoration into thinking I have spent a lot of time on this creation: Mary might not be a fan of biscuit cutters, but I am, and have employed two different shapes for my creation. In all honesty, I could not be arsed to pipe icing around my biscuit, plus I think the biscuits taste perfectly nice without icing, so I just stuck on some fondant which was left over from Andrew’s Welsh dragon birthday cake. 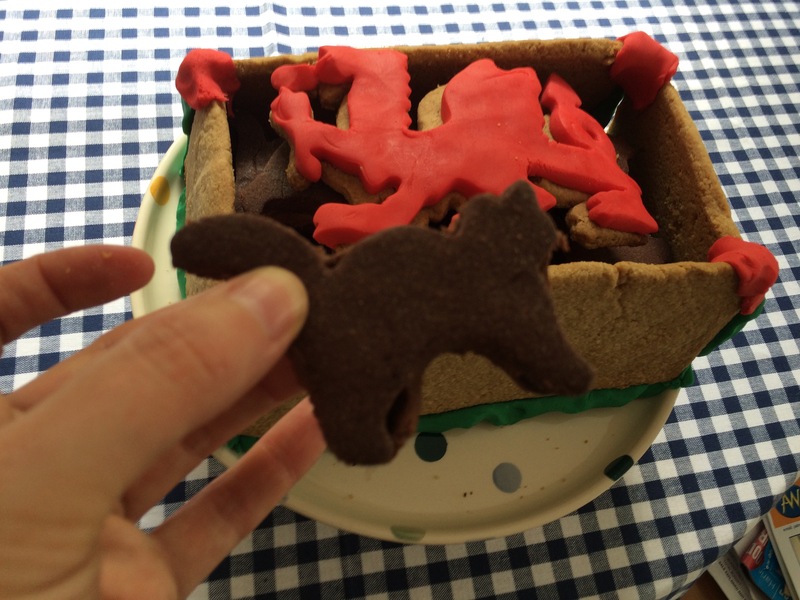 The Welsh dragon box is made using my favourite Rachel Allen oaty shortbread recipe. It’s robust enough to create this (basic) structure and buttery enough to still melt in the mouth. 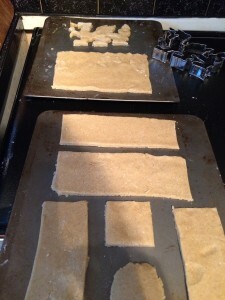 I like that it’s not a traditional shortbread, and dare I say I prefer this oaty version to the all-butter classic. With precision not being a key strength of mine, I just winged it in terms of creating the box: cutting out rectangles which roughly looked like they would fit together. 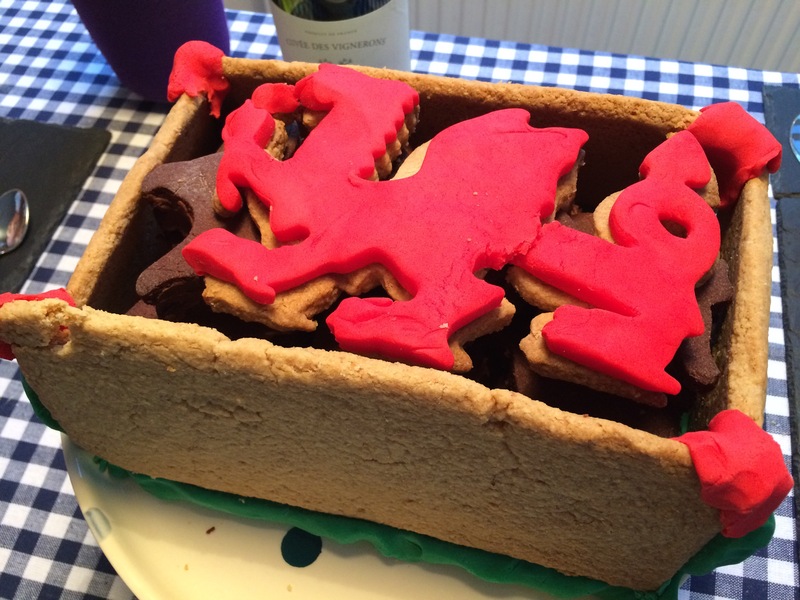 As I didn’t bother to trim the freshly baked biscuit either, what we have ended up with is an uneven box, glued together with clumps of fondant icing, topped with a ‘lid’ (in the very loosest sense of the word) cut out using a Welsh dragon biscuit cutter I found online. 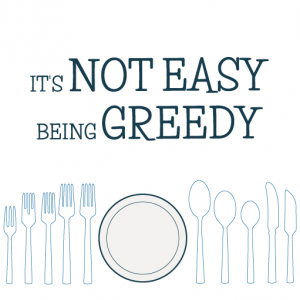 But you can (kind of) see what it is, which is good enough for me! For the inside biscuit, I wanted to make a chocolate variety, as Andrew’s chocoholic Aunt Kate was visiting and I always like to make a chocolate creation for her to scoff when she comes to see us. 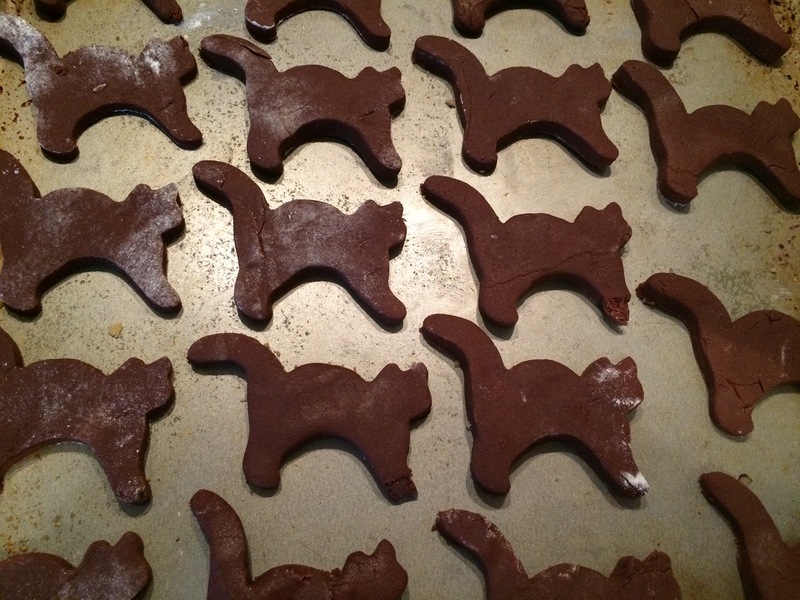 She loves cats even more than we do, so out came my trusty cat biscuit cutter, bought many years ago in a Stuttgart Christmas market (and used at Christmas to make ‘ginger tom’ biscuits). As the box was a relatively simple affair, I wanted a filled biscuit to go inside, and what other filled chocolate biscuit can you get but bourbons? There’s a simple recipe for them on the Guardian website here, which I simplified, and I whipped up a batch in less than an hour. I made these biscuits using my KitchenAid food processor, which was already on because I’d just made the oaty shortbread. I simply blitzed all the ingredients together until combined, chilled the dough in the fridge while the oat shortbread baked (around 20 minutes), then rolled out the dough, cut into cats and baked for 10-15 minutes at 160 degrees. Equally, blitz the filling together until combined and use to sandwich cats together. 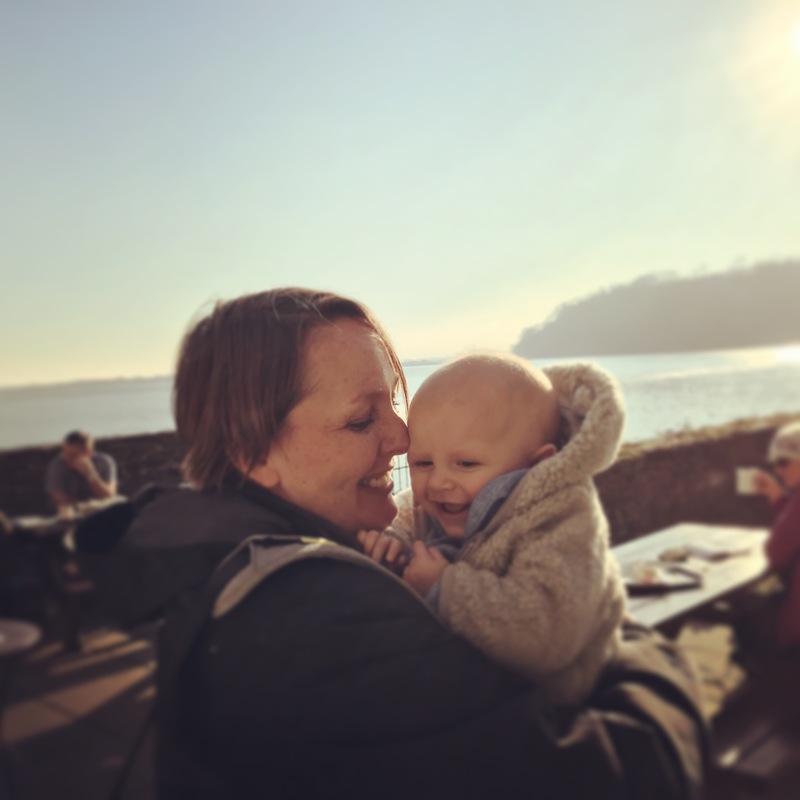 I am taking part in various challenges again, including The Great Blogger Bake Off, Bake of the Week, We Should Cocoa and the Bloggers Bake Along to GBBO. All details below, why not join in? I am very impressed with you biscuit box full of biscuits! 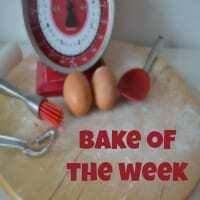 I am going to be making biscotti and attempting arlettes this week for friends coming round to watch GGBO on Wednesday. Ooooh, are you going to make reverse puff? I want to try it, but didn’t have the time this week. Good luck! I love your showstopper creation. 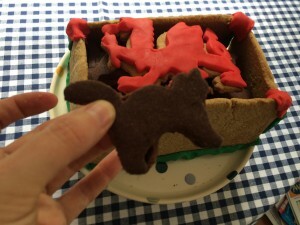 The dragon certainly does look like a dragon; but the best part for me are the ‘ginger tom’ cats! Brilliant idea! I’m mad cat lover too so I’d have given you star baker for that alone! thanks! I am not sure I’ll be able to make a cat shaped 3d bread this week though – Paul’s lion was amazing! I love your biscuit box- and slightly jealous you had the time to make one. I didn’t so had to make biscotti instead which are actually really good and not rock hard like the ones you find in coffee shops. I love your little cat biscuits and the red dragon really sets it all off! Thank you! It doesn’t look brilliant though because I didn’t spend as much time as I should on trimming and decorating it – it tasted yummy though. I will take a look at your biscotti recipe as the tooth-shattering quality of some of them really put me off giving them a try! Kittens, a dragon and a box? That rivals anything on GBBO. 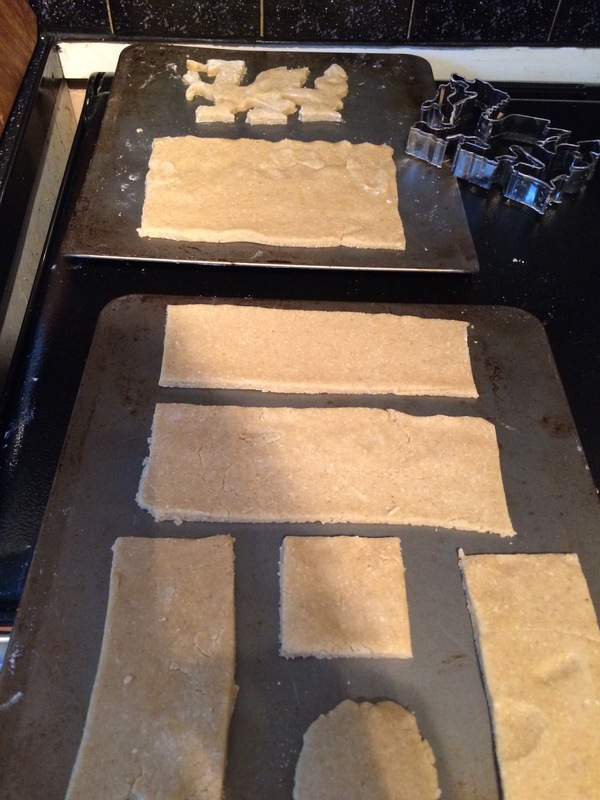 I too don’t always manage to keep my biscuits in shape, so I’m doubly impressed. Great entry to #WeShouldCocoa, thank you. Aw thanks! 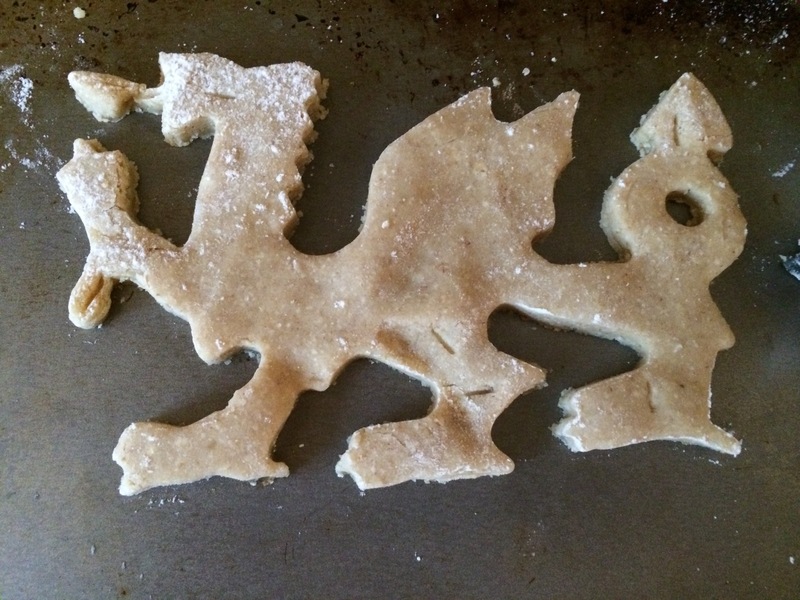 Both of these doughs were quite forgiving and maintained their shapes well – I didn’t even chill the oat shortbread dough and it still maintained the shape of the dragon. I just should have trimmed the boxes after they were cooked, but that was just sheer laziness by me.